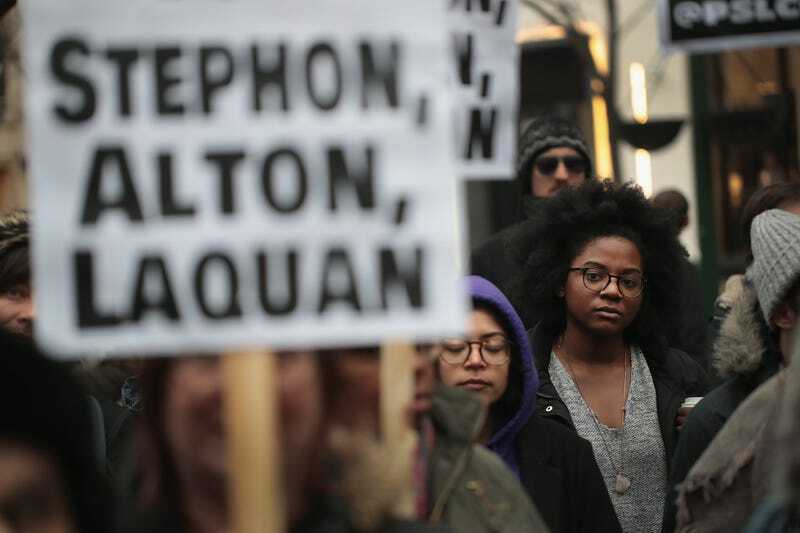 In recognition of the 50th anniversary of the death of Martin Luther King Jr., and in solidarity with the family and supporters of Stephon Clark and others killed by police, demonstrators protest and march in the Magnificent Mile shopping district on April 2, 2018, in Chicago. On Tuesday afternoon, police released the Sacramento County, Calif., coroner’s official report from the autopsy on 22-year-old Stephon Clark, who was shot by police in his grandmother’s backyard March 18. Is it normal for coroners to address the results of an independent autopsy when they write their report for the official one being done by the state? According to the new report, Clark was shot a total of seven times, not eight—and at least three of those wounds were in his back. Dr. Omalu had determined that Clark was shot eight times, with six of those shots hitting him in the back. In addition, a toxicology report showed traces of cocaine, cannabis and codeine in his system, with codeine and hydrocodone found in his urine. Omalu said in March that Clark was first struck in the side, the force from that bullet spinning his body around so that his back was to the officers, and six rounds then hit him in the back. Dr. Gregory D. Reiber, a Roseville, Calif., pathologist who reviewed the county’s autopsy report at Gin’s request, disagreed with that finding. Reiber did not study Clark’s body himself but, rather, used the county report and diagrams, photos, police bodycam videos and other evidence to write a report on his findings. “It is clear from review of the written report and photographic documentation that Stephon Clark was struck by seven bullets, not eight as claimed by Dr. Omalu in his press conference statements and as shown on his autopsy diagram,” he wrote. Weird, it almost sounds as if this report is being written to match what police claim happened. Reiber also said that Omalu misidentified an exit wound as an entrance wound, and said that was why the pathologist stated that Clark had been shot eight times. “This is a significant error as it leads to incorrect conclusions regarding the relative positions of the victim and the shooters during the event,” Reiber wrote in his report. The cause of death, according to the new report, was multiple gunshot wounds. The first bullet went through Clark’s neck, from right to left and slightly front to back. The second bullet hit his right arm, from right to left and downward direction. The third bullet hit his back, from right to left, slightly upward and back to front. Bullet No. 4 hit Clark’s chest, from right to left, slightly back to front and in an upward direction. The fifth bullet hit his back, from right to left, slightly upward, and it went back to front. The sixth bullet hit Clark’s back, from right to left, horizontal and slightly back to front. The last bullet hit his thigh, from front to back and in an upward direction. In response to Reiber’s report, Omalu told the Bee: “I find it extremely unusual that an outside doctor is reviewing an autopsy report and is coming out to state (I) am wrong. A doctor cannot say another doctor is wrong. All you can say is I don’t agree with the opinion of that doctor. Police have not concluded their investigation into the shooting, and therefore, District Attorney Anne Marie Schubert said that she cannot yet make a determination about whether or not to charge the officers involved. A decision on the case could take many months, she has said. The officers who shot Clark returned to work last week, their paid administrative leave having run its full 30 days.